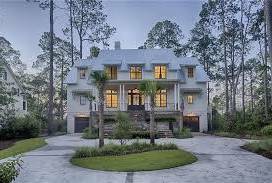 Palmetto Bluff: The epitome of Southern grace and Luxe Lowcountry. Anyone who has traveled down the winding roads through the entrance of Palmetto Bluff to arrive in the charming Wilson Village knows why Conde Nast’s Travel & Leisure consistently names Palmetto Bluff as the #1 Resort in the U.S., now operated by the ultra luxury chain, Montage Hotels & Resorts. With 22,000 acres of pristine natural surroundings (an area bigger than Manhattan which stands at 14.6k acres), residents enjoy 32 miles of waterfront on the May, Cooper and New Rivers, 6500 acres of completely undisturbed managed forests and 734 acres in a conservation easement. Golf enthusiasts can enjoy an 18-hole Jack Nicklaus Signature Golf Course and equestrians will be in horse heaven at the 173 acre Longfield Stables which boasts a covered area, outdoor dressage area, a 5 acre turf event field, a 24-stall main barn and a 14-stall receiving barn.Residential real estate at Palmetto Bluff is categorized as “Town” or “Country” in character. The former will consist of a series of residential Villages, where neighbors live closely by choice, and walk or bike to nearby facilities. The creation of Wilson Village (restaurants, post office, stores, chapel) was the culmination of extensive studies of the characteristics and synergy of Southern waterfront towns, such as Beaufort, Charleston and Savannah. “Country” properties consist of larger homesites, (some up to 30 acres) which lie outside the Village areas and emphasize privacy, natural surroundings and – to the extent desired – seclusion.